Within a single hour, MX-5 Miata fans reserved fifty percent of the allotted MX-5 Miata 30th Anniversary Edition vehicles for the United States. If you can believe it, one hundred of five hundred cars slated for America were reserved in lass than fifteen minutes. After four hours, fans claimed all five hundred vehicles. There is a wait list that is growing by the minute. At the global reveal event were Masahiro, Bob Hall and Tom Matano. It’s important to realize these were the people who were instrumental in the original 1989 MX-5 Miata. There were also members of seven United States Miata clubs present. Did you know there are over one hundred Miata clubs in the nation? They consist of twenty-two thousand members. Of course, Mazda has a history for recognizing MX-5 Miata milestones over the past 30 years. Back in 2015, Mazda sold out 100 of the 2015 MX-5 Miata “25th Anniversary Edition” models within 10 minutes. In fact, if you want to check out the order website and view the waiting list, click here. 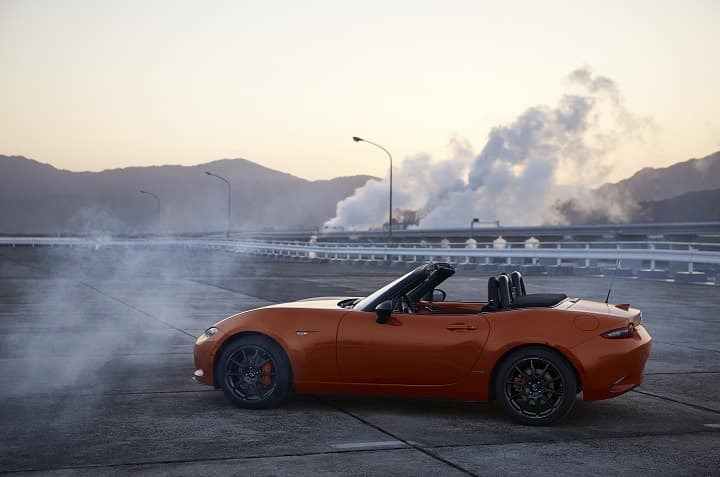 If you want to learn more about the 2019 Mazda MX-5 Miata, or the meaning of “jinba ittai“, by all means, call Beach Mazda today. We have a great selection to test drive and check out! 0 comment(s) so far on MX-5 Miata 30th Anniversary Edition Sells Out!